The stereotype of the entrepreneur has changed. It’s no longer just two guys in a garage. Entrepreneurs come from all walks of life and transcend age, gender, and geography. While we may look different and speak different languages, we are still more similar than dissimilar. We all want the same things, fear the same things, and even make the same mistakes. After a while, I started building two archetypical personas of an entrepreneur in my mind — the artist and the innovator. I’ve found that every entrepreneur I’ve met falls into one of these two archetypes. Let’s call them Steve and Larry. They look quite similar at the outset, but what differentiates them is how they look a year later. A year later, Steve is still building his product. He has no product revenue, and relies on part-time freelancing work to fund his product development. And he works alone. Larry, on the other hand, has a growing customer base, growing revenue, and a growing team. Steve is in his cubicle lost in thought. Earlier that day, his manager told him that their parent company (from a recent acquisition) would be shutting down their offices in a couple of months. And Steve was given a choice to either relocate to headquarters or take a severance package. Steve reads this as a sign. He has always planned on starting his own company when the timing is right. After graduating from university, he made a conscious decision to join a promising startup in order to gain some first-hand experience, before venturing out on his own. Even though his startup had a few bad product starts, they did eventually manage to get acquired. Steve felt really proud to have been part of the core team. “This may be as good a time as any…” he thinks to himself. He decides to take the evening to think things over. He decides to take the plunge and takes the severance package the next day. Steve wastes no time getting to work and immediately starts building out his product. He anticipates that if he stays focused and works full-time without distractions, he should be able to launch his first version in three months. He wants to build his product the “right way” so he meticulously goes about designing and building his product. But little things start taking longer than expected and start to add up — weeks quickly turn into months. Steve is starting to get nervous. The product isn’t up to his standards and his revised estimates put the product out at least another three months…may be even six months. He’ll be out of money by then. He realizes he needs help. He hits up some of his close friends and tries to recruit them — offering up generous equity in exchange. But they don’t see what he sees, and find it hard to justify leaving their well-paying jobs. Steve attributes this setback to a “lack of vision” on his friends’ part, and is even more determined to find a way to finish his product. He decides to hit the pitching circuit and raise money. Steve has never written a business plan before. So he downloads a few templates and picks one he likes. As he starts writing, he finds that he doesn’t know many of the things being asked, but does his best anyway to complete the plan. He’s especially encouraged by the financial forecast spreadsheet. The more he plays with the numbers, the more he’s convinced that he’s on to something really big. He knows a lot is riding at stake, so he spends many more days developing his elevator pitch, outlining his product roadmap, and polishing his 10-page slide-deck. He reaches out to Peter a few weeks later who helps him set up half a dozen meetings with investors. Steve is a nervous wreck during the first few meetings but thinks they go okay. He starts to get more comfortable with practice and feels a lot better about his later meetings. He doesn’t get an instant yes. But at least he doesn’t get an outright rejection either. He debriefs Peter later who reluctantly bursts his bubble. Steve is in a classic Catch-22. He can’t make people see his #vision until he completes his product, but investors won’t give him the #resources to complete his product. What is he to do? Steve still believes in his product and is determined to build it. 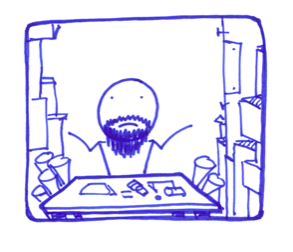 He retreats back into his metaphorical garage and decides to self-fund his idea with part-time freelancing. Larry too was hit by an awesome idea a year ago, but unlike Steve, he doesn’t start with a build-first or an investor-first approach. Larry recognizes that this approach used to work at a time when building products was really hard and expensive, but the world has changed. We live at a time when it’s easier and cheaper than ever to build products, which means that there are many more people “starting up” all over the world. This creates many more choices both for investors and customers. Investors today don’t value intellectual property, but traction. Traction is evidence that people other than yourself, your team, and your mom care about your idea — aka customers. More important, traction is early evidence of a business model. 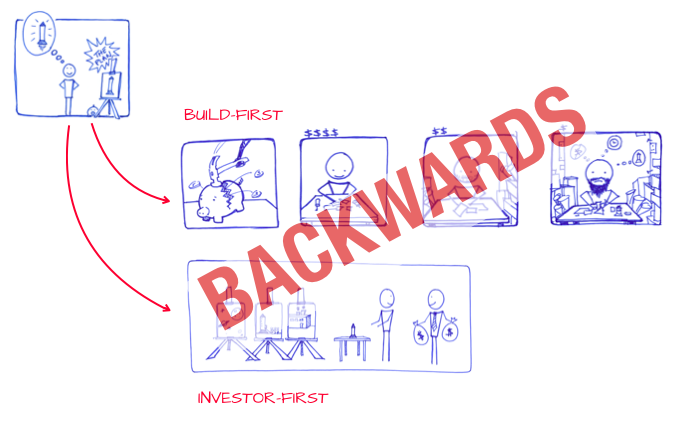 Investors today don’t fund solutions that work, but business models that work. The business model, not my solution, is THE PRODUCT. When building a complex product, one doesn’t start with the easiest stuff, but the hardest or riskiest stuff. Building a business model is no different. Building solutions come easy to Larry. So he instead focuses on what’s hard — building a customer. Larry decides to start with a traction-first or a customer-first approach. Customers don’t care about your solution, but their problems. Larry knows that customers today are constantly bombarded with all kinds of products. The initial battle is getting their attention. And here’s the really counter-intuitive bit…You don’t need a product to do that, but a compelling offer that can stand-in for your product. The challenge today isn’t building a product, but uncovering the right product to build. You build a compelling offer piece-by-piece by first understanding your customers, their problems, and their existing alternatives. Once you have that down, defining a solution becomes a lot easier. Unlike Steve, who is still perfecting and polishing his product a year later, Larry defines his minimum viable product (version 1.0) in less than 8 weeks. A minimum viable product (MVP) is the smallest solution that creates, delivers, and captures customer value. 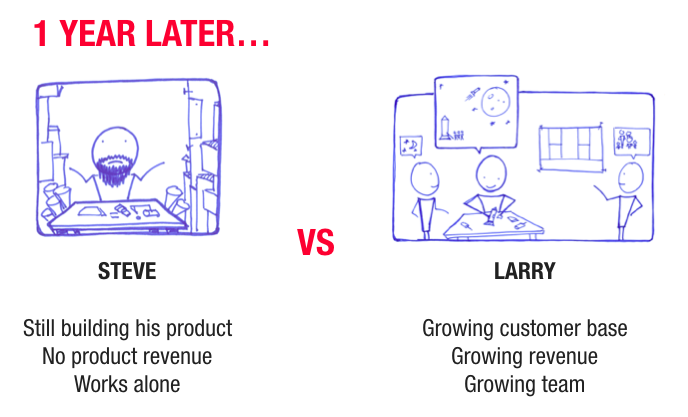 Following this approach, Larry avoids spending needless time, money, and effort building a product he hopes customers will buy with a product he knows customers will buy. This puts Larry’s idea on solid footing and he spends the next 4 weeks building out the first version of his solution. Once completed, he immediately starts charging his customers from day one, who are happy to pay because the MVP nails their must-haves and delivers value out of the gate. Larry continually refines his product from here through many more customer conversations. This allows him to continuously outlearn his competition and always stay a step ahead of them. His customer base is growing, his revenue is growing, and so is his team and business model. The difference between Steve and Larry is not differing skillsets but differing mindsets. Steve is operating like an Artist and is primarily driven by his love for his product (solution). You can easily substitute Artist with Software Developer, Designer, Creative, Maker, Writer, Author, Hacker, Inventor… He takes a build-first approach which in today’s world is highly risky. 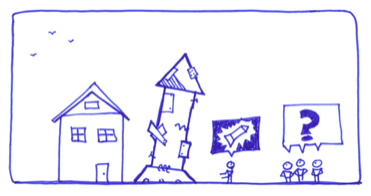 The real question today isn’t: “Can we build it?” but: “Should we build it?”. Larry, on the other hand, is operating like an Innovator. Innovators turn inventions into working business models. 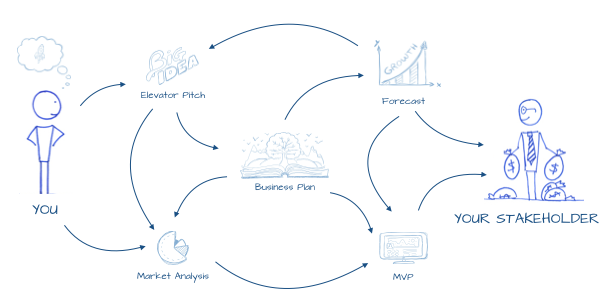 He is primarily driven by turning his ideas into a business model that works. He takes a customer-first approach because he considers that to be the riskiest aspect of his business model at the outset. Once he de-risks those starting assumptions, he continues to systematically de-risk his business model — prioritized from high risk to low risk. 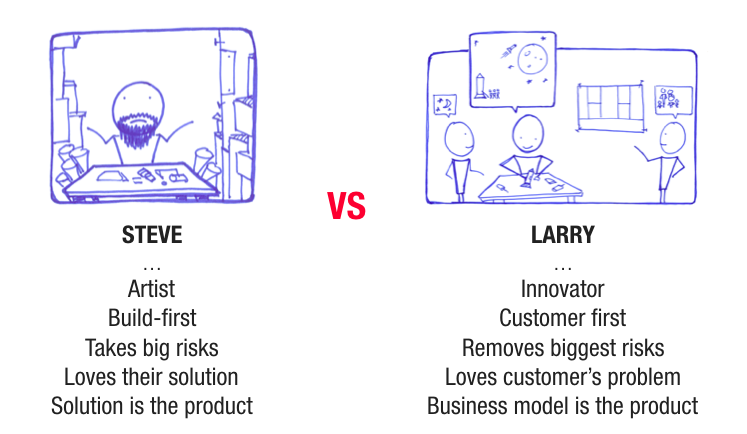 Most entrepreneurs start out like Steve and eventually evolve into Larry. I used to be a Steve too. I too was hit by an awesome idea. An idea so good I never told anyone but close friends sworn into secrecy. I spent a year building out my “big idea” in stealth. And, like Steve, I too struggled to get other people to see what I saw. It took me roughly seven years to transition from Steve to Larry, and there’s been no looking back ever since. This mindset shift has been a game-changer. I attribute all the success and attention I’ve received over the years with my books (Running Lean and Scaling Lean) and the Lean Canvas to this new way of thinking and approaching products. If you’re currently operating as a Steve, then you have a decision to make: Red pill or Blue pill? You take the blue pill, the story ends. You wake up in your bed and believe whatever you want to. You take the red pill, you stay in Wonderland, and I show you how deep the rabbit hole goes. Remember, all I’m offering is the truth. Nothing more. 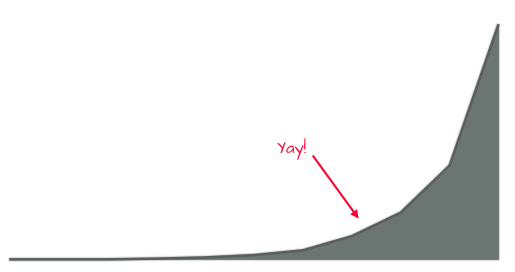 The way we build products has fundamentally changed. 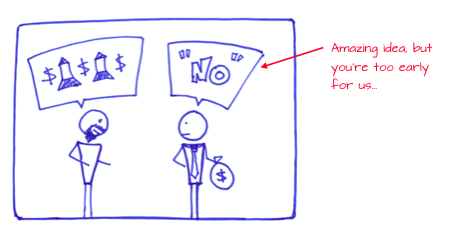 A build-first or investor-first approach no longer works. 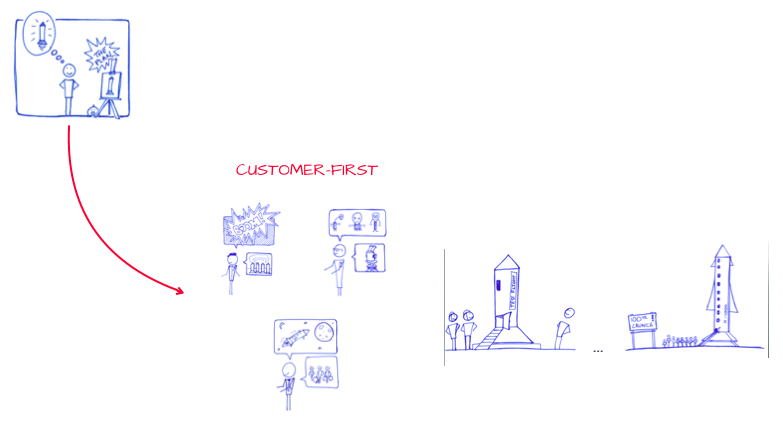 A traction-first or customer-first approach is the new way. The difference between success and failure is a difference in mindsets vs skillsets. Mindset #1: The business model, not your solution, is the true product. Steve, not Larry, is the hero of our story. Click the button below to read Steve’s transformation from artist to innovator.